Experiencing Day of the Dead in Mexico has been one of my all time favourite travel moments to date. 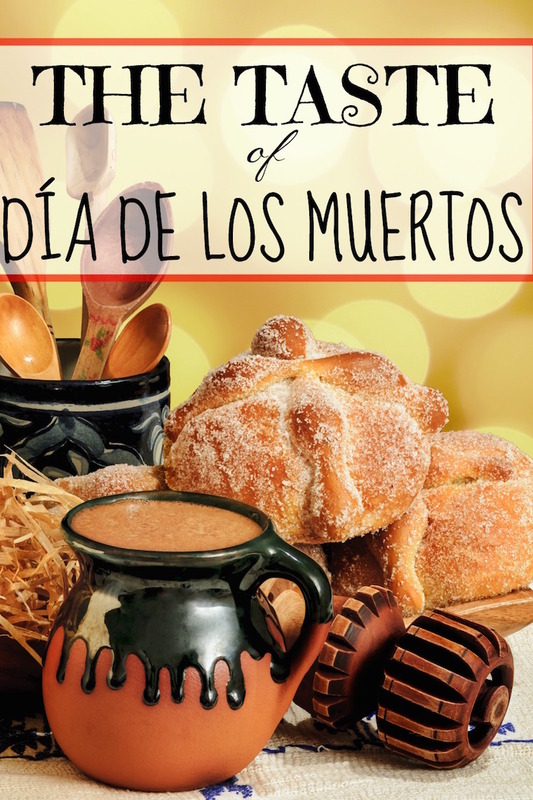 The celebrations we saw in Oaxaca (arguably the best spot for the festivities) were a crazy mishmash of deeply held reverence, centuries-old traditions, modern Halloween shenanigans and A LOT of costumes, parades and partying – but did you know that Día de Los Muertos is also incredibly tasty? On November 1st, the first official day of the celebrations, we travelled to San Miguel de Valle with Fundación En Via, an organisation that supplies microloans to entrepreneurial women living in the towns and villages surrounding Oaxaca. We were lucky to be able to spend time with some of these ladies and learn a bit more about the food and drink traditionally linked to the festival. Families build elaborate ofrendas like the one above to welcome back their loved ones and demonstrate love and respect. 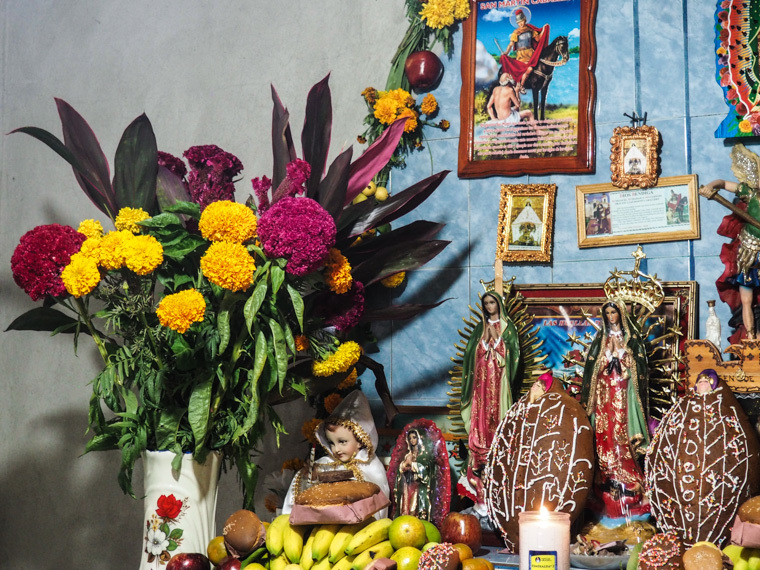 Each ofrenda we saw was piled high with enough fresh fruit to keep Carmen Miranda in hats for a lifetime and, like all the food offered to the dead, it’s for the dead only – it’s left until it goes bad, then it’s thrown away. It must have cost a small fortune to buy all that produce, but it was a huge source of pride to have the best quality and most variety. I guess if your Nanna is making the effort to come all the way back from the dead, it’s only polite to break out the good stuff. Along with the fruit, the ofrendas were decorated with pan de muerto, a light, sweet bread that reminded me of brioche in taste and texture. I’ve seen some versions sprinkled with sugar or decorated with bone shapes, but I have a feeling that those ones are like eating mince pies in November – something fun to get you into the swing of things, rather than for the day itself. The loaves laid out on ofrendas were decorated with intricate icing patterns and had one very peculiar feature – a tiny face sticking out the top. Oaxaca has the best hot chocolate I’ve ever tasted. There’s something about the combination of subtle spices that really helps to draw out the chocolatey-ness. Apparently, like champagne, the flavour lies in the bubbles – so the bigger froth you have on your chocolate, the better it’ll taste. 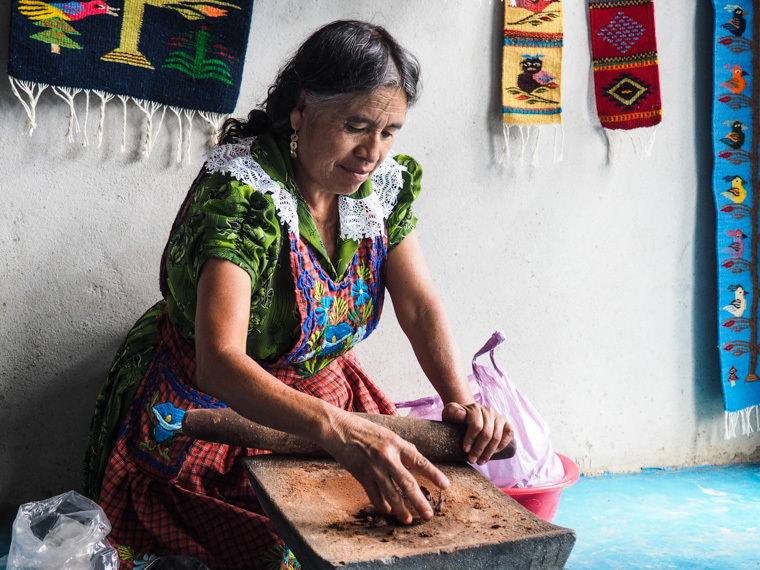 It’s tradition to have hot chocolate and pan de muerto first thing during Day of the Dead, so we got to watch this lady make it from scratch, crushing nuts, cinnamon and cacao together and rolling it all out to make little pucks of crumbly hot chocolate. They were dissolved into water and then frothed up to perfection. 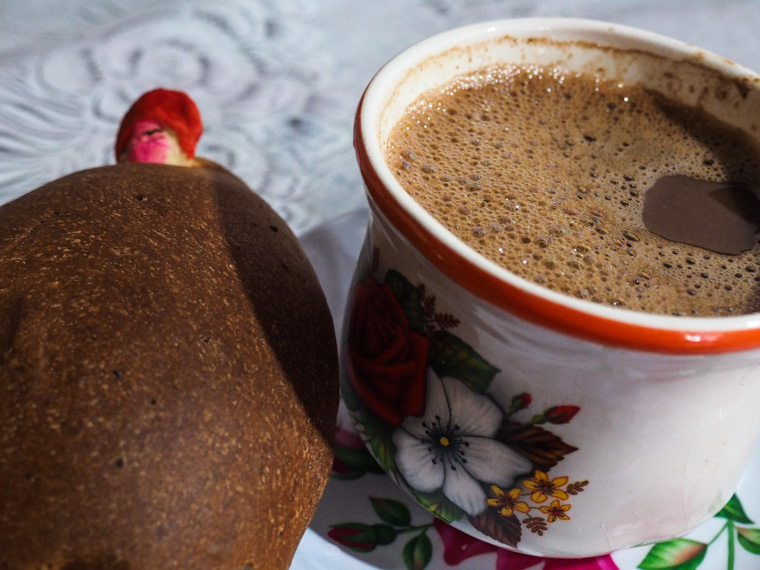 We were given a pan de muerto and a mug of chocolate each, and we followed the example of our host, dunking in the sweet bread to combine the flavours. Heavenly. As you might expect for such an important occasion, a lot of work went into creating the meal. Five days before, 30 cows had to be slaughtered to make sure all the households in San Miguel had the meat they needed. The women of the village had risen at 3 am on the morning of our visit to slowly cook the meat to perfection. 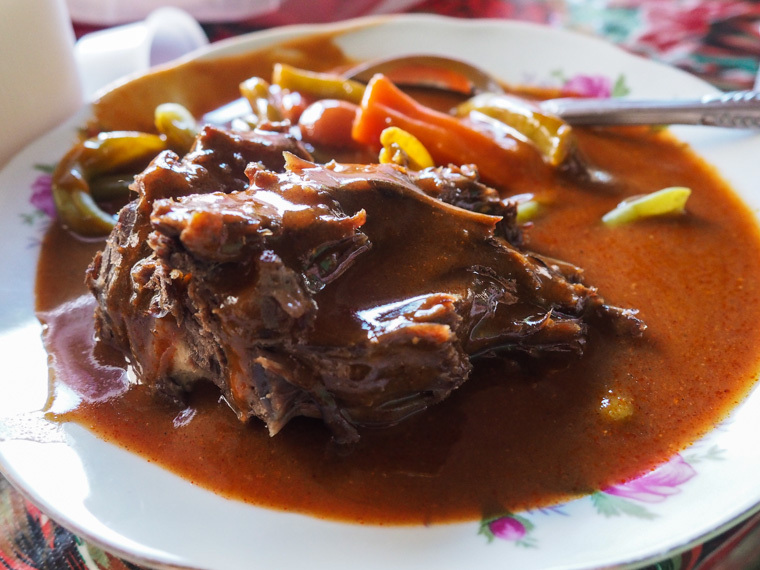 Honestly, it was the freshest tasting beef I’ve ever had – the meat just melted off the bone and the mole was rich and satisfying. 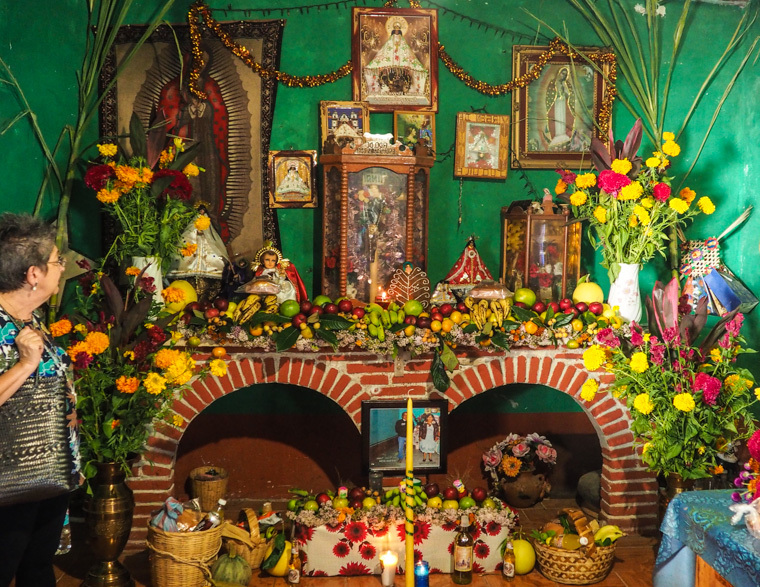 While the living sat down with their families for the meal, a plate was also placed on the ofrenda for each of the returning dead to enjoy – it’s not just for show either, they believe that the dead absorb the flavour, leaving it drained of taste and nutrients. “It would be like eating dust,” was how one lady put it. I’m sure you CAN get edible sugar skulls, but all the ones we saw were not for eating (especially the ones pictured above because they’re ceramic!). Most of the sugar skulls you see are held together with raw egg whites and made months in advance of Día de los Muertos, so if you decide to try one… well, good luck with that. 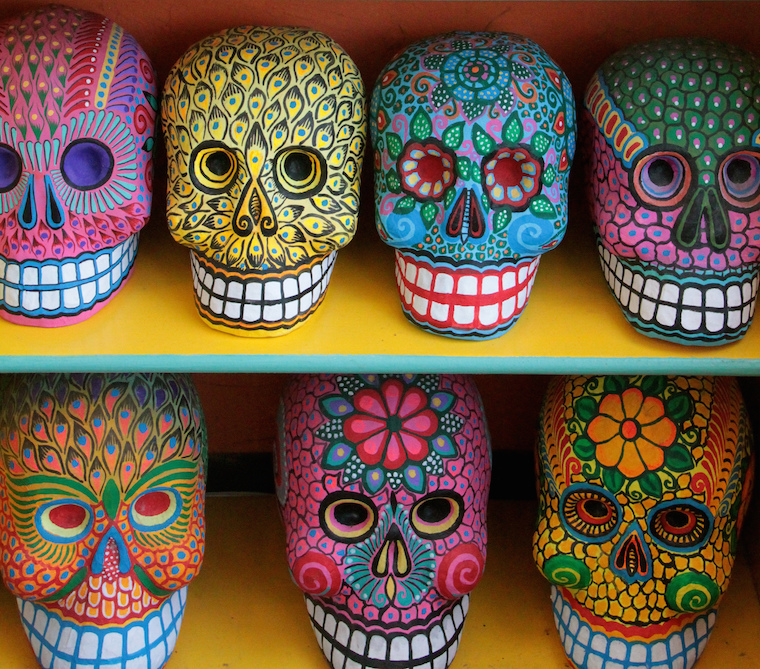 While they might not be as tasty as they look, the origins of sugar skulls are interesting. 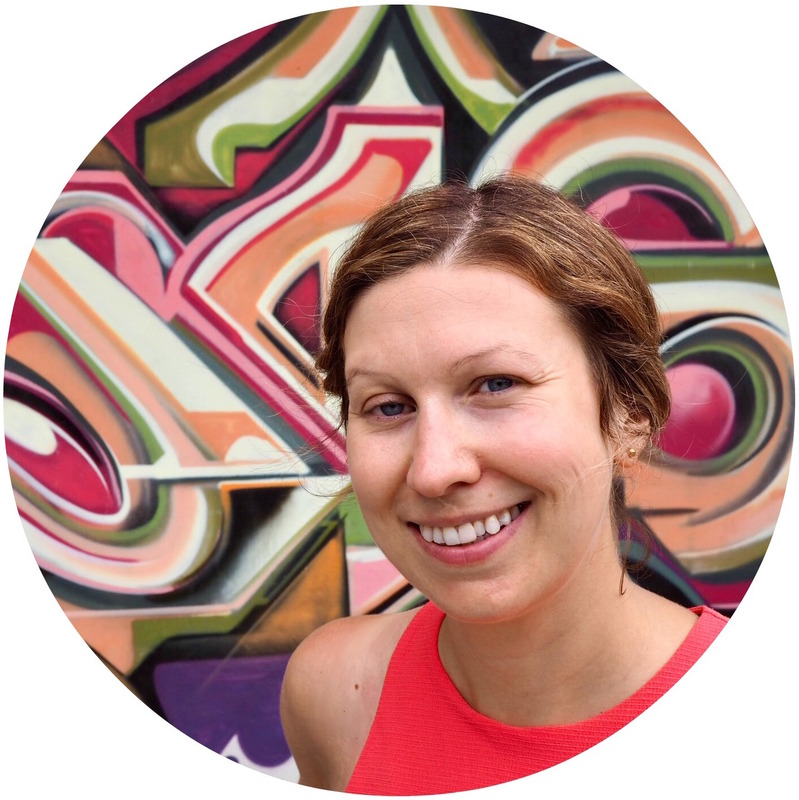 Apparently the Zapotecs – who basically invented Day of the Dead – buried their dead under their homes to keep them close. On Día de Los Muertos the remains would be dug up, their skulls cleaned, and a label attached to them so that Aunty Sue could be distinguished from Uncle Bob. The skulls would be then be polished up, decorated and put on display as a ‘welcome home’ to their previous owners. Thankfully, the tradition has moved on – the fake skulls are more widely used as greetings cards. You can give sugar skulls to friends or family members and write their names on the labels to let them know you’re thinking of them during the celebrations. 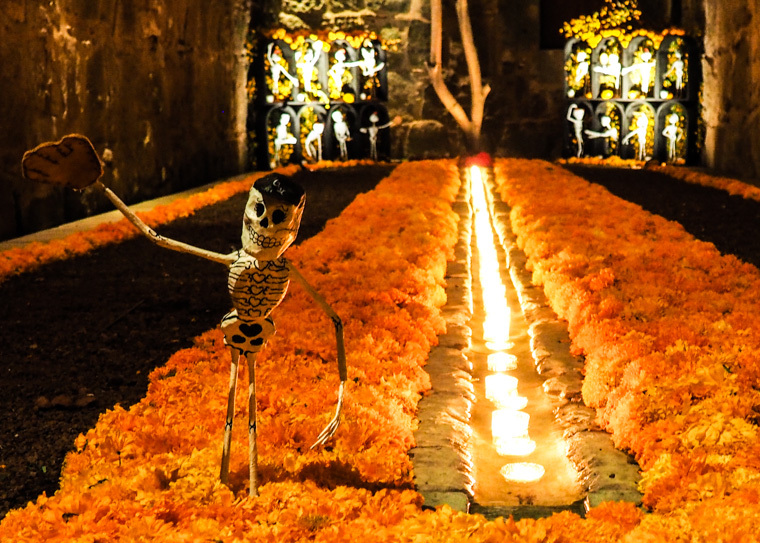 No celebration, occasion or day of the week in Mexico is complete without a drop of mezcal or tequila, and Day of the Dead is no different. One thing I loved about the festivities in San Miguel is that families had an open-door policy throughout. No matter what time of day, your friends, family and neighbours can just drop by to pay their respects, shoot the breeze, and avail themselves of any hospitality on offer – and vice versa, of course. Indeed, in at least two of those homes in San Miguel, I spotted a crate full of mezcal bottles and several packs of beer, just waiting to give to visitors. After the tour had finished we ventured into Oaxaca to take part in the parades and parties, and as we made our way home at around 1 am we stumbled across a little fiesta, quite literally in the middle of the street in the quiet neighbourhood near our apartment. They’d even got hold of some police tape to cordon off both ends of the block. There was a band playing banda music, and people were bobbing up and down dancing to the oompah-style horns in pairs – couples, grandmas with children, friends. As soon as we stopped to watch for a second, a man came over with disposable shot glasses brimming over with mezcal, and made sure we were brought into the group and felt comfortable – that famous Mexican hospitality proven once again. Before we actually got to experience Día de los Muertos, I hadn’t really considered food to be a big part of the festivities. I was too excited about the aesthetics, learning about the history and taking in the celebration as a whole. But when you think about it, it’s just like any other human event: weddings, wakes, Easter, Lent, Ramadan – food is at the heart of all of them. It’s how we connect with people and feel a part of something. And when I recall our Day of the Dead experience now it’s those small moments, spent with kind people sharing food and drink, that stand out most clearly. 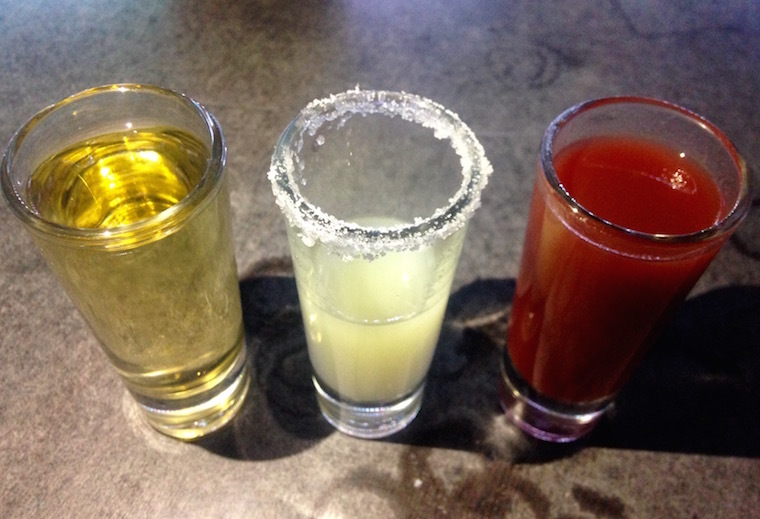 If you get the chance to taste Día de los Muertos: take it. And bring me back a hot chocolate.